Drinking glasses that were a gift from Humphrey Bogart have sold for more than double their expected price. Humphrey Bogart gave public relations man Bill Rowland Hill the six small and five large glasses for his help publicizing the 1951 film The African Queen. They were sold for £8,000 ($12,500) to a private buyer from Europe at an art and antiques fair in London. It had been expected that they would sell for about £3,500 ($5,500). 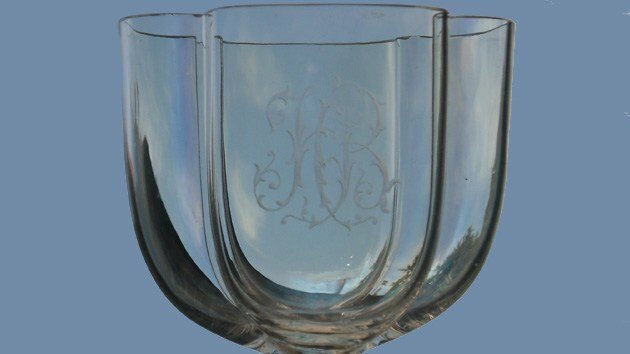 The glasses, which were engraved with the initials HB, were accompanied by a letter on 20th Century Fox-headed notepaper from Pinewood signed “Bogie”. He thanks Bill Rowland Hill for his PR work and “all the other little things”. The letter reads: “My Dear Bill. Before I leave for home I want to say, one big <<thank you>> from the bottom of my heart for all you have done publicity wise both on the set, and in Africa. “I wanted to send you some Hootch but on second thoughts I want you to have something to put it in. “Will you call at that fancy store (Heal’s) on Tottenham Court Street and see a guy called Gaylard. Choose yourself a dozen glasses from the suite I have had made. John Huston’s World War 1 film, The African Queen, tells the story of American Rose Sayer – played by Katharine Hepburn – who escapes a village burned down in German East Africa on a boat owned by rough-and-ready Charlie Allnutt, played by Humphrey Bogart. It won Humphrey Bogart the best actor Oscar in 1952. The 11 glasses were being sold by antique glass dealers Mark J. West, of Redhill, Surrey, at the 23rd Winter Fine Art and Antiques Fair at London Olympia.